Rising crude prices, strengthening Dollar i.e. depreciating local currencies and widening CAD (Current Account Deficit) in case of India, are some of the key factors that are affecting major of emerging markets across the globe including India in recent past. Now this supported by possibilities of raising interest rates (by US FED and probably followed by ECBs) makes the spread between debt and equity returns narrowing. It is this time when we in India generally see floods of non equity i.e. Debt instruments in the market. One of the very common is NCD or Non Convertible Debentures. Currently in month of September we can see Debentures announced by companies Tata Capital Financial Services Ltd, Indiabulls Commercial Credit Ltd, Aadhar Housing Finance Ltd to name a few (refer table). So let us understand what are NCDs and their significance for an investor. What are NCDs (Non Convertible Debentures)? A debenture is a debt instrument that offers a fixed rate of interest for a specified future. They are generally not secured by physical assets or collaterals. Unlike normal Fixed Deposit wherein Banks takes ownership of repayment of amount taken from retails investors; Debentures are generally issued by the borrowing company to the individuals. Debentures are generally backed by the general creditworthiness of the issuer. Like other type of bonds, debentures are documented in an indenture. Hence Debentures are a legal and binding agreements, contract or document between two or more parties. Debentures are most common form of long-term loans by corporate or governments which are repayable on a fixed date and pay a fixed rate of interest. Basic difference between the two is that Convertible Debentures are ones which can be converted to stock at agreed terms and conditions whereas Non Convertible Debentures cannot be converted into equity. Ideally, since a lot depends on the creditworthiness of the issuer in the market, it is observed that companies with lower creditworthiness will have to offer a higher return to attract investor interest. So investors looking only to earn interest rates can expose themselves to high risk. Creditworthiness of the issuer is ideally looked basis the credit rating provided by the Credit Rating Agencies like CRISIL, CARE, ICRA to name a few. It is observed that AAA rated issues are well accepted by the market participants. Should you invest in NCDs? Further one should also consider the other alternatives like PPF wherein income from PPF is exempt from tax. Also senior citizens have alternatives like Senior Citizens Savings Schemes (SCSS). As interest income from SCSS is taxable one need to see if they are more lucrative compare to NCDs. Systematic Withdrawal Plans (SWP) from Debt Mutual Funds may show better returns considering post tax calculations; as with debt mutual funds, capital gains on units held for more than 3 years are taxed at 20% after indexation. However returns may be attractive in this case but one should also understand that there is risk in debt mutual funds too. Ideally NCDs gives investors and edge over Bank Fixed Deposits by holding them in demat form, cash flow by way of annual interest payment and liquidity in terms of selling NCDs post getting listed on exchanges. Investors who are underweight in their investments in Fixed Income Instruments can take benefits by investment in NCDs provided they understand risk associated with same. NCDs are ideal solutions to investors who need regular income and fall in lower income tax brackets. The investors who fall in higher tax bracket i.e. 30% tax rate and not looking money for his basic daily requirements should not adhere to NCDs. Why do Companies raise funds via issue of NCDs? Major objectives that were seen during the latest NCDs issued by the companies in Indian markets were to raise money for funding expansion plans, retiring debt, supporting working capital requirements and other general corporate purposes. NCDs worth Rs 10000 crs to 18000 crs are lined up in next one or two months. Out of which issues worth Rs 10000 crs are scheduled in current month with Tata Capital Financial Services launching NCD worth Rs 7500 crs. Aadhar Housing Finance and Indiabulls Commercial are others who will come up with NCD issues in September 2018. 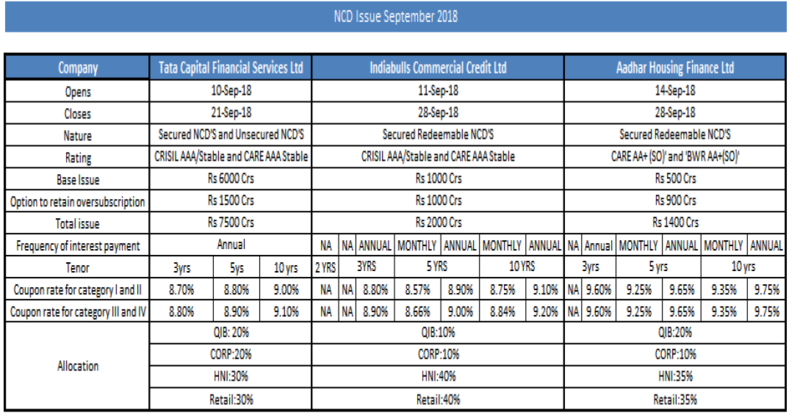 These NCDs are offering interest rates around 100 to 200 bps higher rate of interest compares to Bank FDs (which are still major source of resource mobilization in India). The trend in the funds raised through NCDs can be visible in the below table. We can easily make out that the Funds raised via NCDs are directly linked to Equity Market Performance. Fund-raising via NCDs was less in FY 2017-18 compared to the preceding financial year as companies’ preferred initial public offering (IPO) and qualified institutional placement (QIP) route to garner funds. Companies raised Rs 84000 crs via IPOs during year ending March 2018. Srei Infrastructure Finance garnered Rs 351 crs against base amount of Rs 200 crs. In current fiscal, the amount raised so far is more than 4 times than the amount that was raised in the entire last fiscal year. It is estimated that the NCDs route has raised more than Rs 19000 crs so far. Individually, Dewan Housing raised Rs 10945 crs against target of Rs 3000 crs, Shriram Transport garnered Rs 3648 crs against target of Rs 1000 crs and Muthoot Finance raked in Rs 3000 crs against a base size of Rs 500 crs. In current market scenario, where we can see that global tensions, rising inflationary concerns due to increasing crude prices and possibility of rate hikes are making Individual and High Networth Investors give a thought to reshuffle their investment portfolios. The quantum of funds raised via NCDs is an indication of increasing popularity of Debt Instruments viz a viz Equities or equity linked Mutual Funds. We sense that amount of funds raised through NCDs may be threat to the quantum of funds getting allocated to Equities especially via Mutual Funds Schemes. Prakash Modi is AVP- Advisory at Narnolia Group. He is MBA in Finance and has more than 13 years of rich experience as an Investment Advisor to retail, HNI and institutional clients in equity and commodities.Prakash Modi is AVP- Advisory at Narnolia Group. He is MBA in Finance and has more than 13 years of rich experience as an Investment Advisor to retail, HNI and institutional clients in equity and commodities.